I cannot believe that May is already here. I hope that everyone is doing well. We enjoyed April and the March of Dimes walk. Hopefully next year we will have all of you out to join us! We will be having our play dates the end of the month as the first of this month is pretty packed for me with going out of town, etc. I am also hoping that we can meet at River Walk as May will be our last month of tolerable weather! Friday, May 21st - River Walk Play Group 9:30 a.m.; bring your strollers and if the weather is nice we can all enjoy a nice walk around the park and then let the kiddos play. Friday, May 28th - River Walk Play Group 9:30 a.m.; bring your strollers and if the weather is nice we can all enjoy a nice walk around the park and then let the kiddos play. Have a great month everyone and please, invite anyone you think would benefit from being a member of our group! We will get the word out this month to the Regional Center and will also be passing out fliers to Darlyn's Darlings, a day care center for special needs children. I hope you each enjoyed the Easter break. I am sorry to be getting this out late but we have had some "family happenings" that have kept us busy. Below is the April activities. Our April 17th March for Babies/March of Dimes walk is coming up in 12 days! Tuesday, April 20th: Play Group 9:30 a.m.
Thursday, April 29th: Mom's Night Out 6:30 p.m.! Come enjoy good friends and good food at the north west Mauricio's (10700 Rosedale Highway). Please let me know if you plan to attend so I can make reservations. We look forward to hopefully including more Mom's in this club as our purpose is to provide support and friendship for Mom's raising special needs children. Hope to see you throughout the month! I can hardly believe that March is here. I am grateful for the oncoming spring as I am sure you all are. February was hard for this house. We suffered from RSV and pneumonia so hopefully we have a healthier month ahead! We changed play group back to mornings because we did not have any support for the afternoon time. If this changes come summer, please email me and we will try and organize a summer afternoon play group once a month. Monday, March 1st - Blind Babies vision specialist Kristi Spaite will visit us from Valencia. She is presenting information on vision deficits at the Terrio Therapy Easton Drive office at 1:00 p.m. If your child has vision issues, please attend! She is an amazing source of knowledge and if you do have a visually impaired child, you know that Kern County has very little to offer our children! Tuesday, March 23rd - Play Group 9:30 a.m. If this is your first time attending the play group, please respond to this email and let me know you plan to attend. I will send you the address to my home. If you know of ANY Moms who need a supportive group to join, please invite them! We are always looking to get the word out that we are here to support and befriend others going through this beautiful and challenging experience of raising a special needs child. Thank you ladies, we hope to see more of you attend our upcoming activities this month! My sister, Valerie, is in her grad program at George Washington University and is doing a blog and discussion group for mothers with children with special needs. She needs your help! 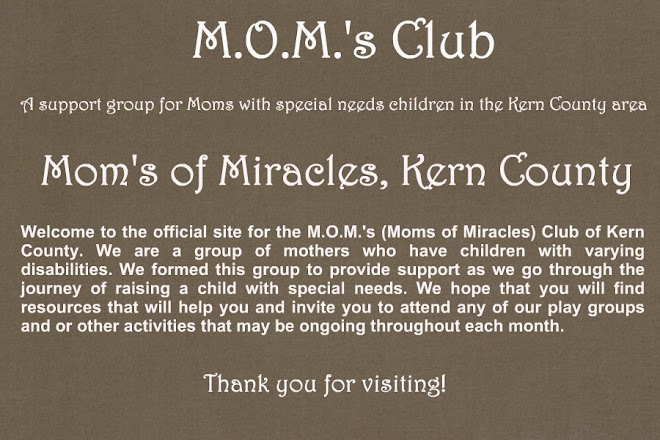 Please go to www.mothersofmiracles.org and click on discussion board (on the right) and join her discussion group. The more people that come and comment on her website, the better grade she gets. This is a quick and easy service project and would help my sister out A LOT! This Wednesday's play group at 10:30 has been rescheduled to the following Wednesday, February 17th at 10:30. This month we plan to have both a morning and afternoon play group. Our morning play group will be Wednesday, February 10th at 10:30 a.m. We will have our first afternoon play group on Wednesday, February 24th at 2:00 p.m. Mom's Night Out will be Thursday, February 25th at 6:30 p.m. at California Pizza Kitchen. Please RSVP for the dinner so reservations can be made. If you are new to the play group and need the location email mhanna0514@yahoo.com. We look forward to seeing everyone. Please spread the word, we would love to increase our membership! January 2010 Calendar, Happy New Year! Wednesday Jan. 6th - Morning Play Group 10:00 a.m.
Wednesday Jan. 20th - Morning Play Group 10:00 a.m.
Thursday, Jan. 14th - Mommy Night Out, 7:00 p.m.
*We hope to schedule afternoon play groups as well as a guest speaker who will discuss her experiences with raising a special needs child! Keep checking the blog for updates.